Graceful. Glowing. Gorgeous. 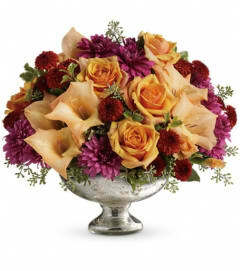 This stunning centerpiece will make setting the mood and the Thanksgiving table nothing less than perfect. 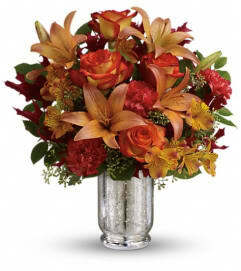 Fall's most fabulous flowers surround a candle inside hurricane glass. Now that's true class. 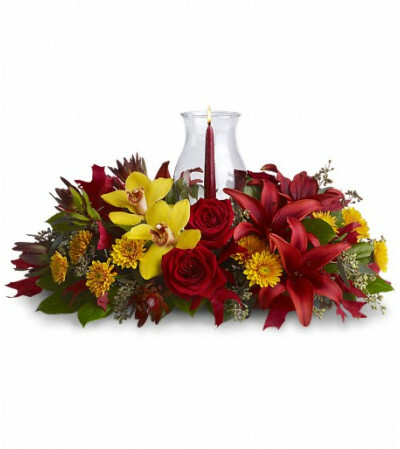 Brilliant yellow cymbidium orchids, red roses, burgundy asiatic lilies, bronze cushion spray chrysanthemums, red leucadendron, eucalyptus and red oak leaves, are on dazzling display - surrounding an artisan candle and hurricane glass. A glowing way of showing gratitude.